I love gravy. I mean, who doesn’t? 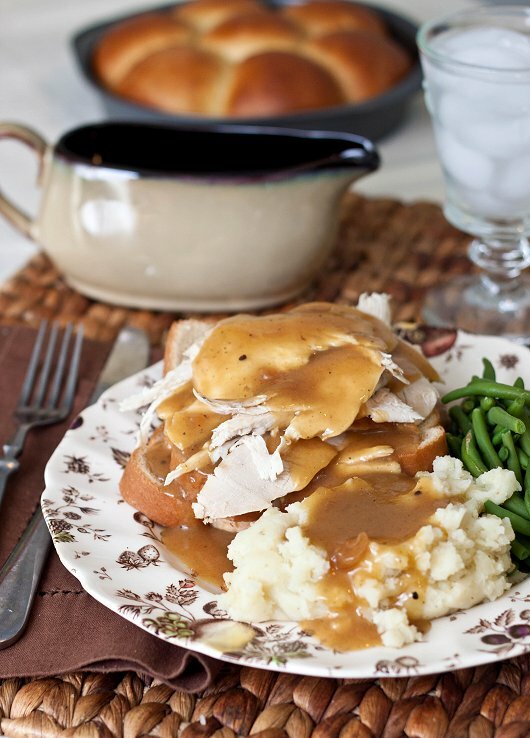 Let me just go ahead and put this out there – this gravy is the gravy to end all gravies. I was always a fan of white wine in pan gravy, but the use of hard cider just takes it to a whole new level. I first turned to it out of desperation. We were out of wine, but had some bottles of hard cider that we’d bottled the year before. It’s nice and dry, and is very similar to a white wine in flavor to begin with – but much more complex. It was so good that I’ve been making it ever since – all year long. It’s equally good on chicken, and I’m looking forward to trying it with pork sometime in the near future. We enjoyed leftovers on hot open-faced turkey sandwiches the next night after making the turkey, and it was all I could do not to lick the plate clean. Don’t let all those delicious drippings in the bottom of your roasting pan go to waste this year – turn it into a delicious gravy. Place the empty roasting pan over 2 burners over medium-high heat. Add the cider and cook for 1 minute, scraping up the bits stuck to the pan. Pour into the skimmed drippings and add enough broth to make a total of 4 cups. Add the broth mixture to a large saucepan, and bring to a boil. Combine the cornstarch and cold water to form a slurry, then whisk into the broth. Reduce heat and simmer until thickened, 8 to 10 minutes. Season with salt and pepper to taste before serving. This looks awesome!! What a gorgeous picture. I am totally saving this gravy recipe for the future. Wow! This looks fan-freaking-tastic. I think I’ve just changed my gravy recipe or Thursday.